Hello everybody. 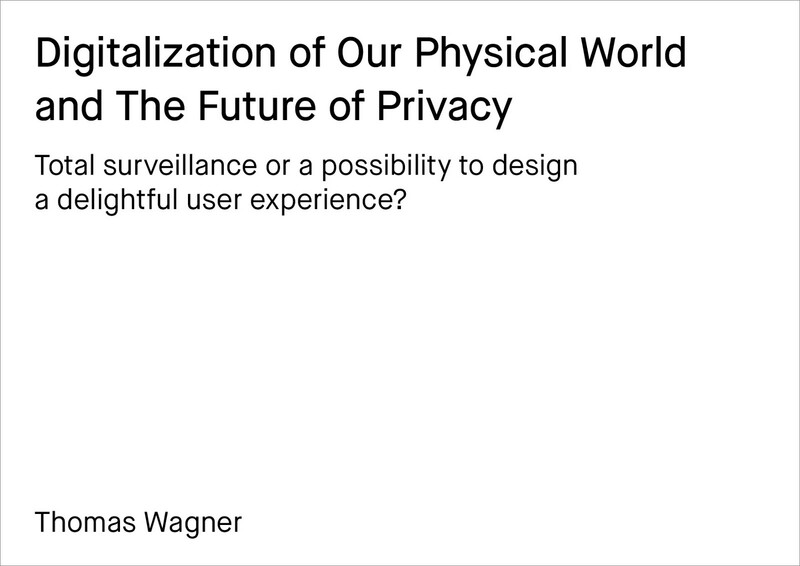 I choose for my GDF forecast the topic of the „Digitalization of our physical world and the future of privacy.“ I asked myself the question: is a world of total surveillance inevitable or are there possibilities to design a delightful user experience? I started my forecasting with desk research and a STEEP map. 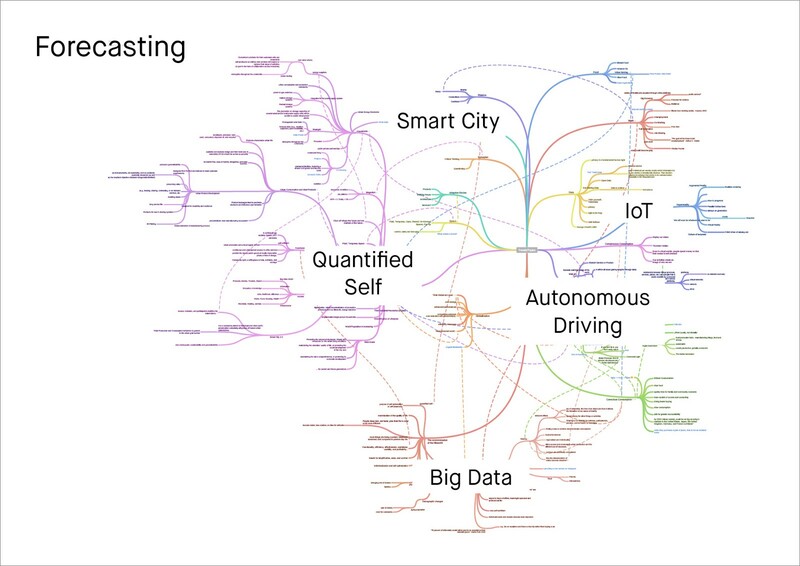 I identified trends in different areas like: Smart Cities, Autonomous Driving, Big Data, Quantified Self, Wearables and the Internet of Things. A main trend that I have identified after mapping all of those topics, was that the Internet will emerge into our physical world. We will always be connected. In 2020 there will be 50 billion devices which are connected to the internet. The internet will always be present, and will feel more like a conversation and experience than a „place“. The collection and use of private data will be almost invisible and unavoidable. 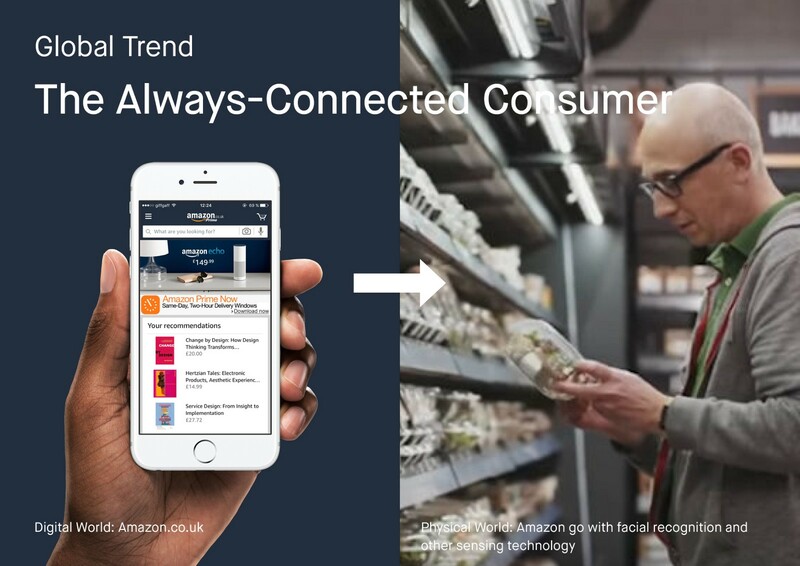 After identifying this global trend, I started further desk research and gathered data from blogs, newspapers, books, academic papers and surveys. I wrote blog articles about: Smart Environments, Internet of Things and the lack of trust, profiling, inevitable technological progress and privacy issues. In the last weeks the discussion around privacy was also present in the news. After the terror attacks in London, private WhatsApp messages from the terrorist were kept secret. 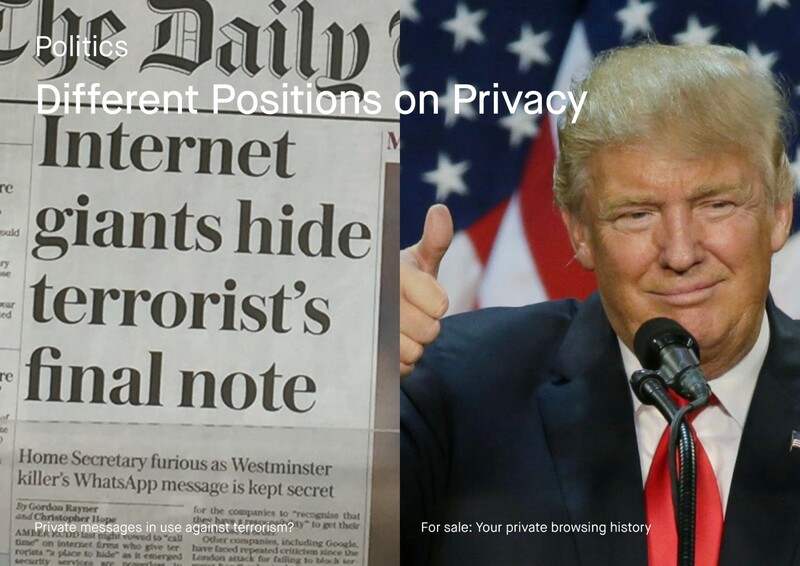 On the other side of the world, Donald Trump killed a set of rules which allow internet service providers to sell data of private browsing histories. When we leave the public space and have a look at our most private place, our home, we are now able to connect this space with all leading tech companies. This year, WikiLeaks has published documents, which give information about the CIA hacking program „Weeping Angel“. It allows them to hack into Samsung smart TVs to use them as covert microphones. 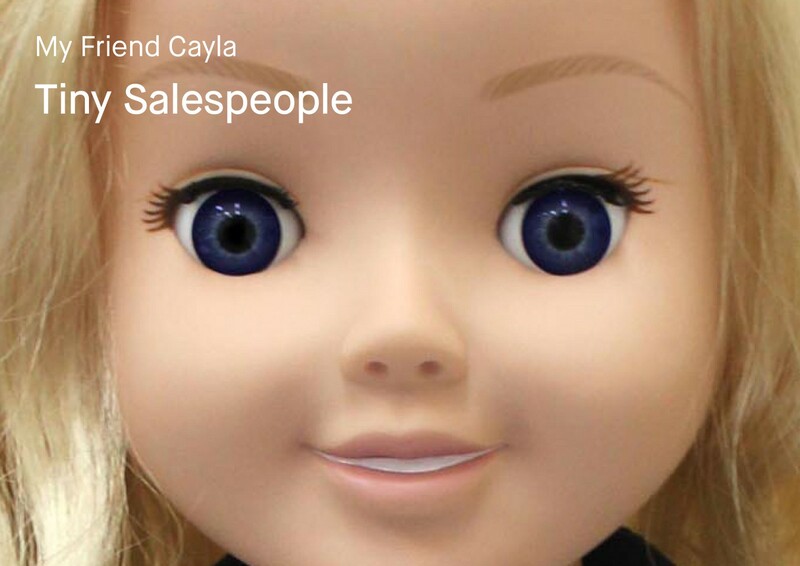 Another example where privacy of users is violated, is this IoT device for kids: The toy records and collects private conversations of young children without any limitations or regulations. It is also pre-programmed with phrases around Disney. These product placements are not disclosed and difficult for young children to recognize as advertising. Those examples leads to 3 weak signals that I have identified. 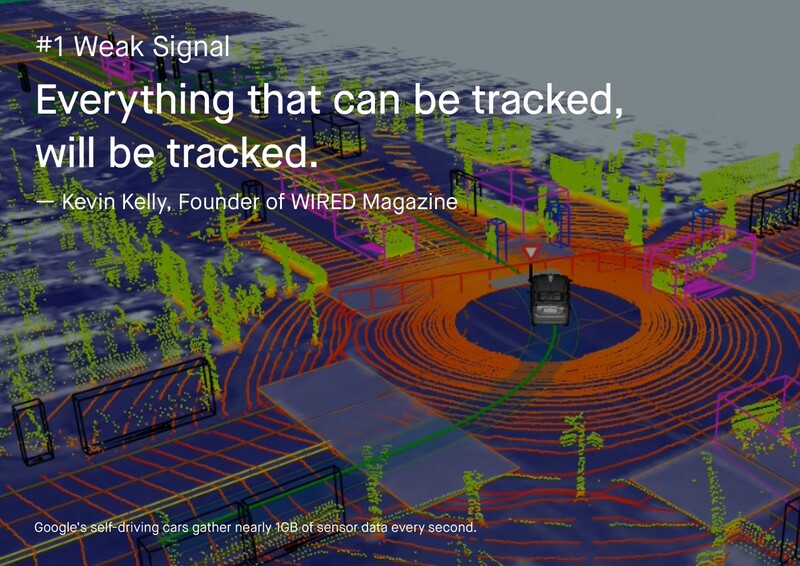 Kevin Kelly said, everything that can be tracked, will be tacked. How would a world look like when every thought, utterance and action is captured, archived and analyzed? Who is watching us and why? What if we apply the technology of autonomous cars into our environments? The core aim of environments becoming „smart“ is to provide personalized interactions but there is also a massive potential for misuse of information. With constantly tracking, we will create blueprints of our lives. Data can be used for profiling which enable aspects of an individual’s personality or behavior to be analyzed and predicted. 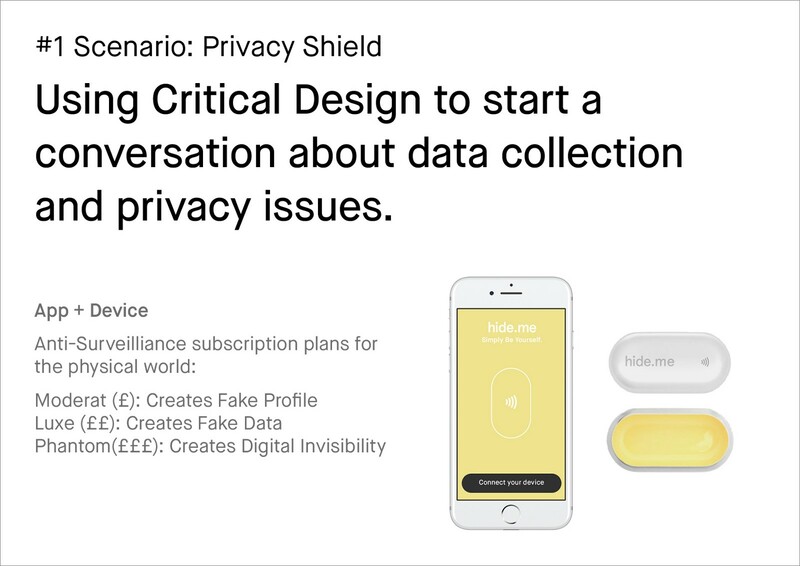 After gaining these insights, I was able to define my provocation: What if privacy becomes a luxury good? I choose a critical and negative provocation because I identified that this kind of future already exists in a certain way today. I want to picture the implications of how it could evolve over time if we don‘t react. I will create two possible future scenarios. The first one is a dystopia, where you have to pay for privacy. 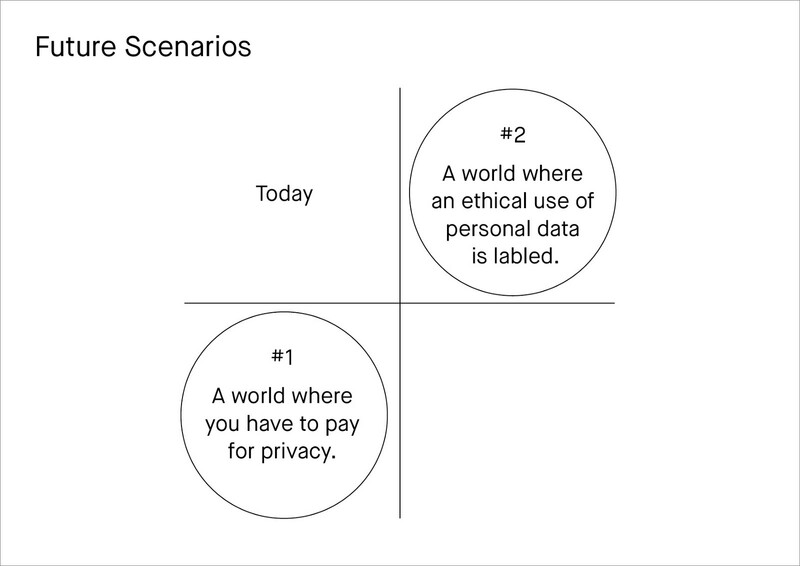 The second scenario is a more utopian future where an ethical use of personal data is labeled. I hope, with these two different scenarios, I will gain a diverse spectrum of insights about the future of privacy and data usage. The first scenario takes place in a world of total surveillance, where you can‘t avoid data collection. 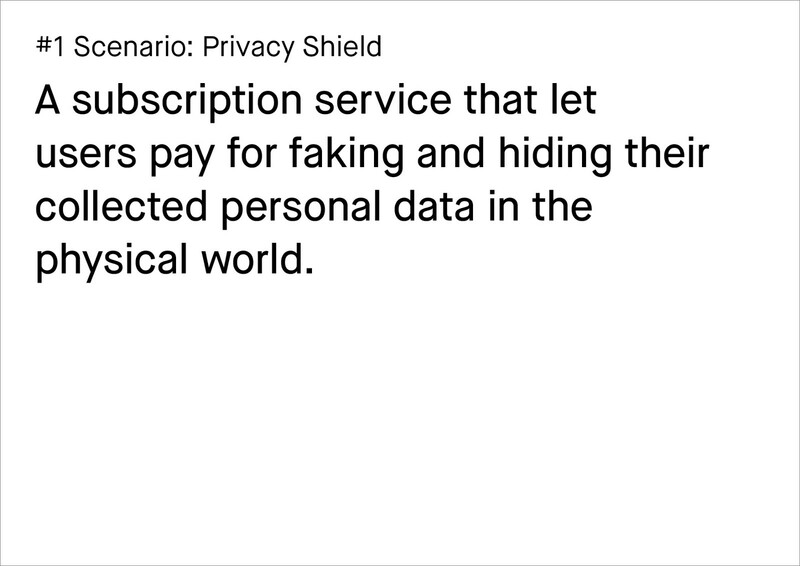 I want to create a subscription service that let users pay for faking and hiding their collected data. A connected device will create and send fake data to insurance companies or block data collection like eye tracking or face recognition. 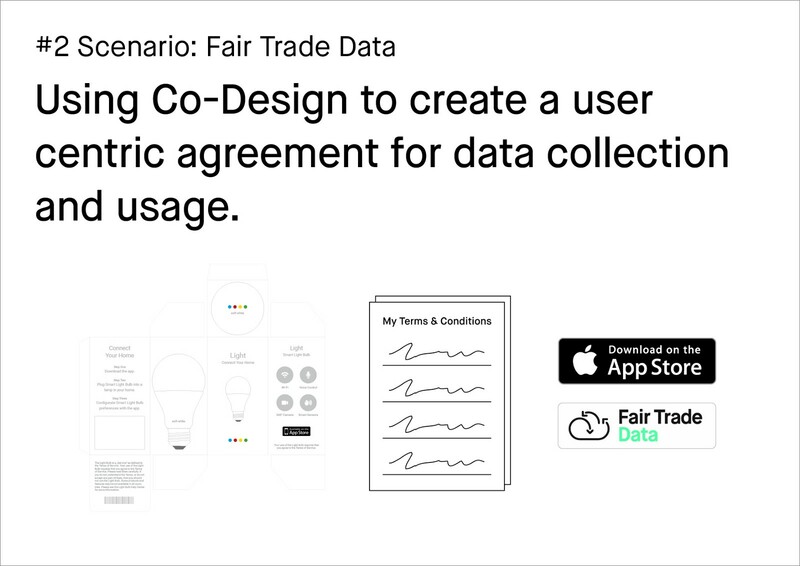 I want to play with the consumable ethics of technological devices and start a discussion to gain insights about what people think about the benefits of personal data collection. Is it really about hiding personal data or more about the mistrust in companies related to in-transparency? 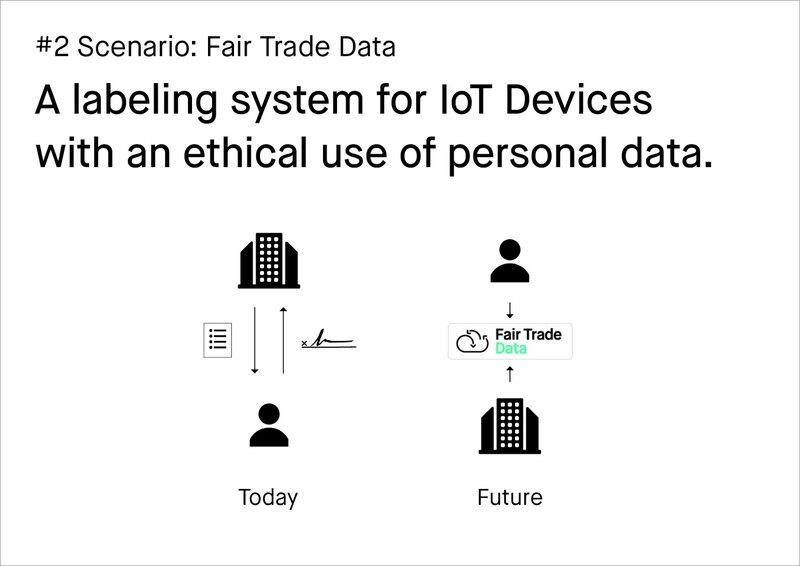 The second scenario is a labeling system for IoT Devices which allow users to identify Products and Services which meet agreed standards for an ethical use of personal data. I want to generate insights about the concerns of users about privacy issues. Are they aware of how their data is collected and used by organizations? To start the discussion I will create a prototype of an IoT Product. For gaining insights about their concerns, I let them create their own Terms and Conditions of how they think a company or organization should handle their collected data. I will use these insights to create an overall agreement for a certification and labeling system. 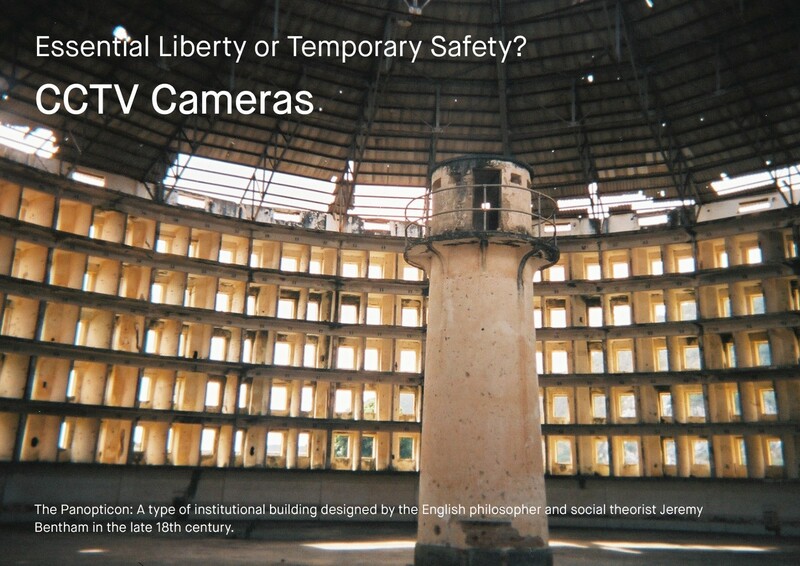 With these two experiments I hope to gain insights on how people see the future of privacy in our digitalized world. If technologies are not compatible with our society‘s core values, sooner or later they will cause extensive damage. Do they trust the way organizations collect and use their private data? To avoid a world of total surveillance and use technology to create a delightful user experience, we as Service Designers always have to think about the implications a design will have. 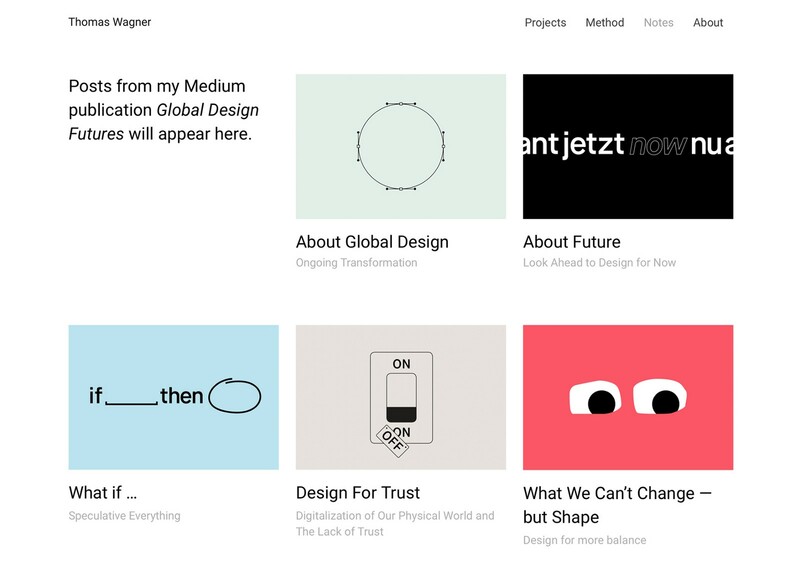 It will be as much a design problem as an ethical one. The time has come for Service Experience Designers to get very intentional, we have to ask for how data is collected and what it is used for. 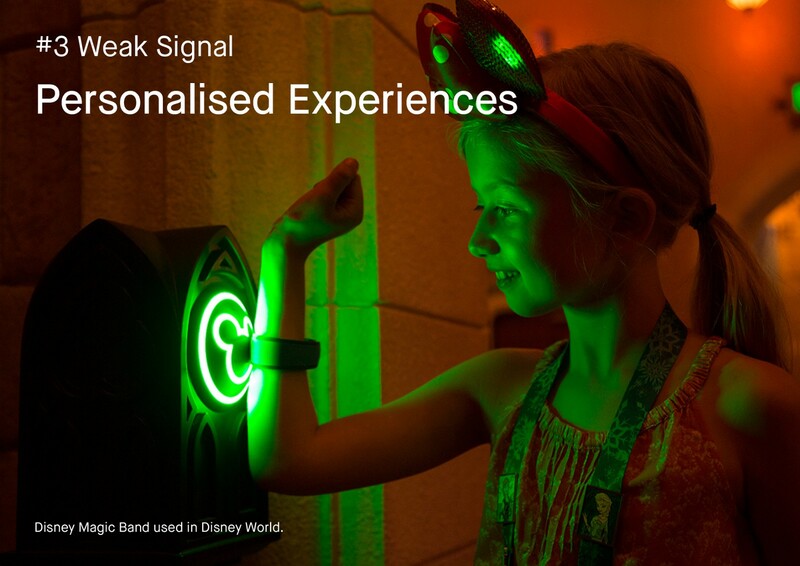 In the end, our Job is to design experiences that benefit both our clients and the consumers. 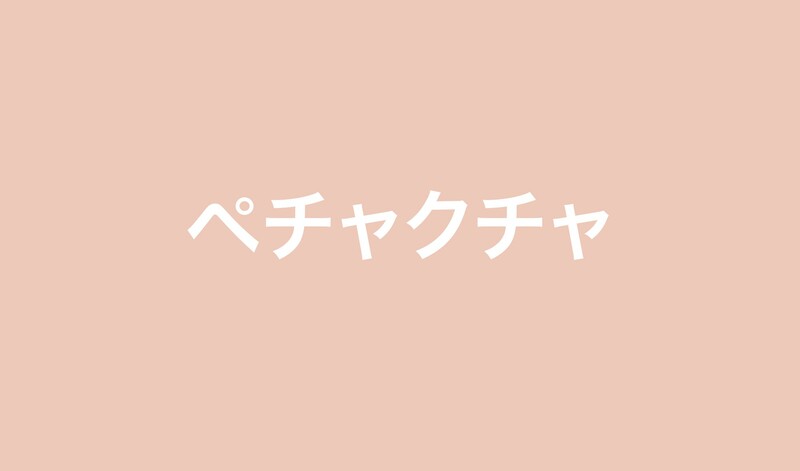 Good design should create relationships built on enjoyment and trust, not suspicion and frustration.